Yoga is one of the most effective ways to relieve back pain. Whether you learn yoga exercises the tough way or go for easy 5 minutes yoga everyday, you are bound to get relief from back pain! Back pain has become a common issue these days. Have you ever thought why? Poor posture, prolonged sitting, no activity, straight bending from your hips, slipped disc, etc. affect your back immensely. Besides, a strain in your neck also impacts the back. Showing a specific focus on strengthening the back muscles will help you avoid many health complications and not only back pain. Usually, the back muscles don’t get enough exercise. In an attempt to negate the effects of your lifestyle, either you stay active or you strike to find a balance to schedule some physical routine, the back muscles aren’t benefitted much. In such a situation, your back is prone to many conditions, from acute pain to degenerative disc diseases. Specific exercises for back pain relief are essential to make you free from your discomforts. Yoga for back pain is one of such techniques that will help you a lot in your quest for relief. Why Yoga? Stretching and strengthening your back muscles, amplifying the bone health and indulging yourself into tranquility! What else do you need? Yoga is an ancient practice. It is a form of therapy that heals and cures many health ailments. Yoga exercises for back involve stretching, backward bending, and twisting the body that manipulates the lower back muscles and associated organs. Yoga exercises improve the severe pain caused due to chronic conditions like degenerative discs, disc bulge, compression, etc. However, if you have chronic conditions, you should consult a doctor or a certified yoga trainer before you practice the yoga exercises to get rid of lower back pain or other back related issues. There are more than 1000 basic yoga pose and millions of variations available. You have to choose the yoga exercise considering your requirement, health condition, fitness goals, degree of pain, etc. Remember, that combination of different set of yoga exercises as a package is named differently. There is nothing called Iyengar Yoga specifically. It refers to a set of yoga poses. Similarly, there is nothing specifically called hot yoga poses, except when it is performed in a room with warm temperature. Following are few basic types of yoga exercises that involve practicing a set of exercises for back pain. Iyengar yoga is the best form of yoga you can practice if you have back and neck pain. The specific set of yoga exercises focus on alignment of the spine and involves precise moves. Properties or accessories are often used as a part of Iyengar yoga to enable flexibility, ease of practice and avoid injuries or strains. Besides, Iyengar yoga provides easily alternatives to every pose. Alternatives to each pose enable the one with severe back pain practice the yoga with ease. For instance, downward dog facing pose. You should stretch your entire body from your hip to the hands and bend towards the floor. Since you shouldn’t bend forward, instead of touching the floor you can stretch your body and touch the floor. Similarly, in case of yoga poses that involve side stretches and touching the feet, you can touch the wall or place a chair. Hatha yoga refers to a set of yoga exercises performed in specific sequences that is designed to energize the tiny channels of the body. It also aligns your muscles, bones and skin. Above all, the core objective of hatha yoga is energizing the spine. So, that’s obvious it reduces even chronic pain and improves the health of the spine. Hatha yoga generally involves breathing exercise, doing a specific sequence of yoga and meditation. Also termed as power yoga, it is recommended only when you have rehabilitated from any injury of your back. It involves strenuous pushups, lunges, stretches, and bends and not recommended for anyone with chronic injury. Popularly referred as hot yoga, it refers to practicing a set of yoga exercises in a warm temperature. When the temperature is hot, it increases flexibility and eases doing the different yoga postures. It is because, the heat stretches the tissues, improves blood flow and relaxes the muscles. It also aids in detox! Collectively, bikram yoga reduces back pain. However, you should practice bikram yoga only under guidance and supervision of a trainer. Bikram yoga is not for people with high blood pressure or cardiovascular diseases. Viniyoga is a customized yoga designed to adapt to every individual’s concern and associated with healing back injuries. Remember, in order to practice these set of yoga exercises for back pain, you should get training from a yoga practitioner. There are few yoga poses that are restricted when you have back pain. Let us look at a few stretching and backward bending yoga poses that specifically address lower back pain. Remember, if the pain persists even after doing these yoga asanas or worsens after yoga, please stop doing these poses and consult with a yoga trainer or your physician. It is a seated spinal twist pose that makes your spine supple and increases the elasticity. It also opens your chest and hips. Sit straight with legs extended and keep your feet together. Raise the right leg and place the feet over the left knee. Breathe out and slowly return back to normal position. Turn the waist, your neck, release the right hand, then left hand, right leg and then left leg. Repeat this posture with other side. It is a full body stretching pose that provides great relief from pain and muscle twitches. It also strengthens your back. It is one of the effective spine strengthening pose. Regular practice of this pose prevents back injuries, stiffness and strain. Repeat the same with left leg It is a relaxing yoga pose for back pain. It also provides a lot of energy. It is a simple yoga pose that stretches your hip flexors, hamstrings and thigh muscles. It is a simple stretching exercise that act as hip opener, improve the thigh muscles, benefits the lumbar region and provides a lot of flexibility. It also helps strengthening the urinary bladder, pelvis and abdomen. Specially, it enables a lot of blood supply to uterus, back and abdomen. When practiced to perfection, this yoga asana reduces sciatica and reduces the heaviness of your body. Join your soles and lower both the knees on the floor. Just hold your toes and flap your thighs. This is called butterfly flapping. This is just an extension of this yoga exercise which reduces strain in the hips and lower back and also tones your thighs. Flap your thighs as faster as you can. As another extension, bend your body towards your toes and touch the toes with your forehead. It gives good stretch to whole body. Whether your pain is moderate or intense, you can get relief in 5 minutes. There are certain yoga poses that provide you quick relief from the episodes of pain. Listing out the five yoga asanas as ‘5 Minute Yoga for Lower Back Pain!’ These yoga poses are very special in treating the pain and strain in the spine. The yoga pose is named after the sage, Matsyendra who discovered different spinal twist poses. This is one of the easy poses that provide quick relief from chronic lower back pain. When you turn left side, right leg should be bent. Instead of bending your knees, you can just extend your leg, place the right ankle over left leg and lean your lower body towards left and vice versa. Bend your knees and put right knee over left knee and lean over the left side and vice versa. If you have mild to severe pain, you can effortlessly alleviate it with this easy pose. This is a therapeutic yoga for osteoporosis and chronic lower back pain. It is an invigorating yet simple pose that anyone can do. Lift your hips to the maximum height possible to make the most of this yoga. If you feel not so comfortable or lack support, just hold your ankles with hands and raise your body. Try to stay in this posture for a minute. If not, do it twice or thrice that lasts for a minute. This is a combination of classic yoga poses that provide relief from back pain in few minutes. It involves two different types of yoga poses that moves your spine, from flexion to extension of the spine. This specific pose should go in tact with the rhythmic breathing. Without proper inhalation or exhalation, it won’t be effective. Repeat this for 3 to 5 times. After practicing the inhale and exhale, you can make an extension to this pose. This extension stabilizes your joints and aligns your spine. It also adds strength to your whole body. Repeat the set for 3 to 5 times. Initially, you may feel lack of balance and tremors. Don’t panic. If you cannot stabilize, just stay for a second or two. Stretching is the best way to strengthen your muscles. It is a form of backward bending pose. No exercise can strengthen your back muscles than Bhujangasana. Besides, it also tones your arms and shoulders as the hands are used as support to practice this posture. It is referred as cobra pose as you will raise your head and torso like a cobra! Raise your head and tilt head back to the maximum extent possible while you get support by pressing your palms on the floor. Stay put this position for 10 counts. Raise your shoulder while the abdomen touches the floor and stay for 10 counts. Raise your upper body until abdomen (you body shouldn’t touch the floor) and stay for 10 counts. When you practice these steps, make sure you don’t move the palms. Adjusting yourself by moving your arms make it less effective. Place yourself comfortably before you start. Repeat this asana twice or thrice. Many times, improper alignment of the spine leads to back pain. For instance, sitting in wrong posture like leaning over the table. This simple pose help you get rid of pain, align your spine, and energize your muscles. Vrukshasana – Vruksha means a large tree! Gradually loser your arms and repeat it with other leg. Initially you may find losing balance. However, upon regular practice you can find stability. Most people who try this asana can easily balance themselves on standing with single leg. However, the key to this asana is single leg standing with arms raised above the head. The combo of these two brings most of the benefits. If you find yourself unable to balance, take wall support. In fact, you can mix and match any of the yoga exercises for back pain to make your own ‘5 minutes yoga daily session for back pain’ Watch this video which shows you how to do some of the yoga asanas for back pain (that you have read above), in only 5 minutes! Sometimes you may need a trainer to practice certain yoga poses . Although yoga doesn’t cause too much pain like exercises, stretching yoga asanas may cause pain. Yet, there are few yoga poses that are quite simple and effortless to do! In fact, even the extremely lazy people can do this yoga asanas to reduce lower back pain. ‘Sava’ means dead body! Just lie down on the floor gently and close your eyes with hands and legs wide apart. Imagine yourself your entire body is relaxed. Spread your hands apart and widen your legs. Take deep breathes and concentrate on your breath. Lie down for 5 minutes. You will feel relaxed and nourished. This invigorating asana help you calm down your body and mind with ease. 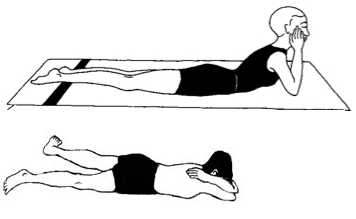 This is an inversion asana of Savasana. Lie down on your belly and widen your legs as far as possible. Place your hands below the forehead and relax for while. Makarasna is one of the easy hip opening pose. It helps you relax the stiff and tensed back muscles and provide good relief from back pain. 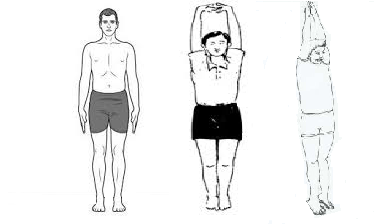 Tadasana is a base asana. It is the base point for many standing yoga asanas. It involves standing straight with feet touching each other. This asana tells you how to manage your posture the right way. It corrects the posture, aligns the spine and reduces the pain. It lengthens the stiff back and extends the spine. There are many variations to tadasana. Practice tadasana and gently inhale and raise your arms about your head. Lower your arms when you exhale. Inhale and raise your arms and clasp it to do namaskar mudra. Inhale and raise your arms. Gently bend backwards and exhale as give above. Do namaskar mudra by placing your arms before your chest. You can also stretch on your left, right and back. You can do the same asana by sitting. Sit straight with both legs bent and placed behind the thighs. Stretch your hands upwards, clasp your arms and stretch sideways when you breathe deeply. When you raise your arms, stretch your hands as possible as you can. This specific yoga lengthens your spine and addresses the twisted muscles, spasms, etc. You will feel acute to moderate pain in your thighs and calf muscles for a few days. It will ease off automatically in 3 or 4 days. The above mentioned poses are specifically mentioned to reduce lower back pain. If you have severe back injury, you may need to consult with your doctor before doing any yoga exercise.